There's that cliche about folks and their slideshows of their vacations, inviting the neighbors over and boring everyone to tears with the endless photos, the snippets of stories that don't quite make sense. Does this still happen? Or do we all just put our vacation photos online somewhere, assuming that somewhere there's a person or two who cares? That's a bit harsh. I know there are a couple of people who will at least not be too bored seeing these. Besides, I'm putting these up for myself. I don't scrapbook, haven't for years, although I like the idea, the carefully arranged photos, the ticket stubs, the stories scrawled into the margins. I just seem to put my time elsewhere. But I want to remember all this stuff, so this is where I put it. 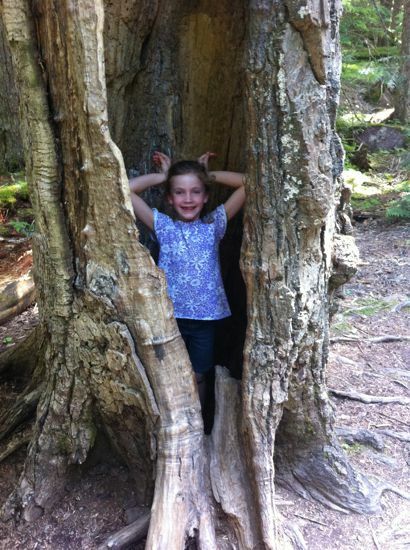 So, fair warning: this post is photo-heavy and is, essentially, Our Summer Vacation. I'll understand if you want to skip the rest of this post and come back some other time. I've got some quilt blocks to post, finally! Back in July, the three of us took a bit more than two weeks off and went on a road trip. A classic American summer tradition. We headed east, which is kinda a big deal since we're coastal people. I've lived near an enormous body of water pretty much my whole life, excepting our time in Europe, and I need that Natural Air Conditioner. Our first stop was at the Ginkgo Petrified Forest, one of North America's most diverse collections of petrified trees. Most petrified forests were buried in volcanic ash; this one is significant for being a swamp full of logs that were then buried in lava. Petrified forests always slightly disappoint me. I want to see the trees still standing, with limb structure. There's something magical in what I imagine when I think "petrified forest" and reality - scientific significance notwithstanding - never seems to measure up. 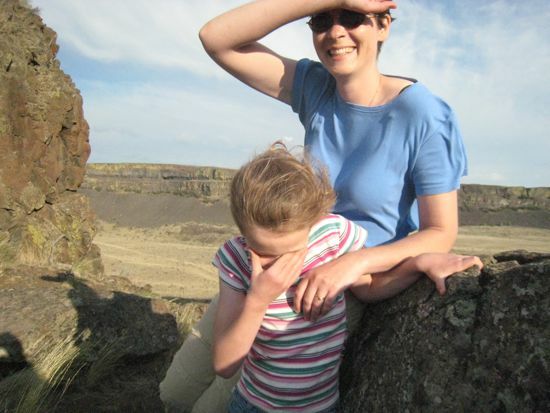 But it was at Ginkgo that I learned about the lava flows of the Columbia Plateau and Glacial Lake Missoula. You can (sort of) see the layers in the cliff edges in the distance in this photo, flow after flow, each thicker than I am tall. I'm not certain I understand where it all came from (not the Cascades, that was pretty clear), but there's a lot of it. And then there was an ice age and an ice dam, roughly at where Missoula, MT, is today, which created Glacial Lake Missoula, believed to be the largest such thing ever. The dam broke, several times apparently, and all the water it had been holding back went charging toward the Pacific. All 500 cubic miles of it. 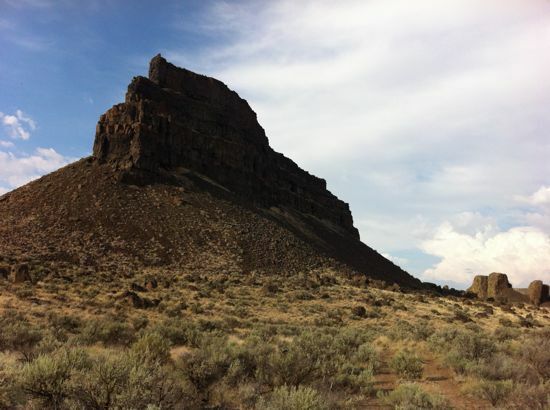 Dry Falls is 400 feet tall and more than 3 miles wide. The floods released when the ice dam failed moved at 65 miles per hour - this waterfall must have been spectacular, although with the water 300 feet deep going over the falls, I have no idea where one would have stood to admire them. Or who would have, this all happening 15,000-20,000 years ago. 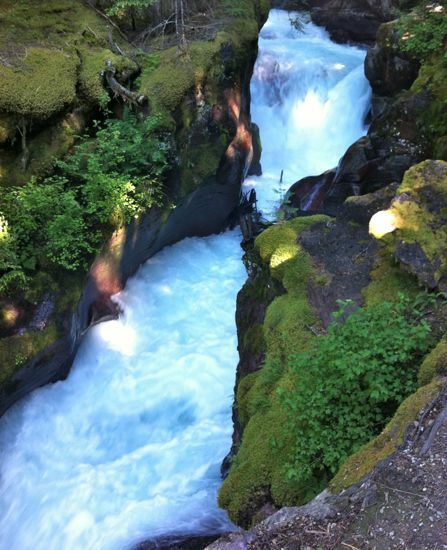 Now, you can drive up to the lake in the plunge pools at the base of the falls. 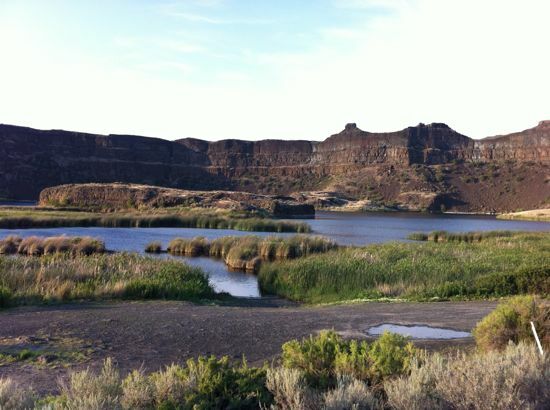 Or you can park further back and hike around and over Umatilla Rock in Sun Lake/Dry Falls State Park. Sparse and windy but so dramatic. Caitlyn is hiding because the wind was kicking the dirt up something fierce. We took the trail off the rock in turns, cowering out of the wind while we waited. 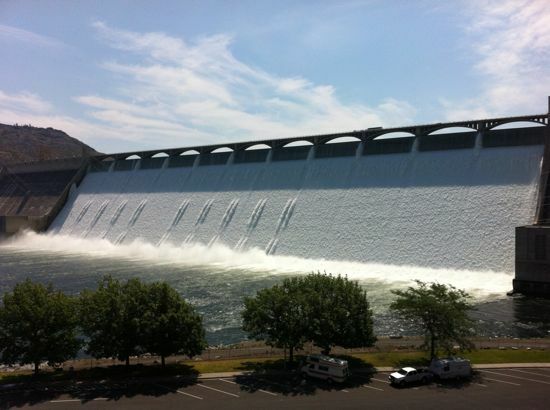 Then onward up the Grand Coulee to the Grand Coulee Dam. Yes, they have a laser show after dark. It's very 80s. This is what Washington looks like on the other side of that huge dam. Perfectly straight roads. Irrigated fields with the Green turned up to eleven, under a brilliant sky. 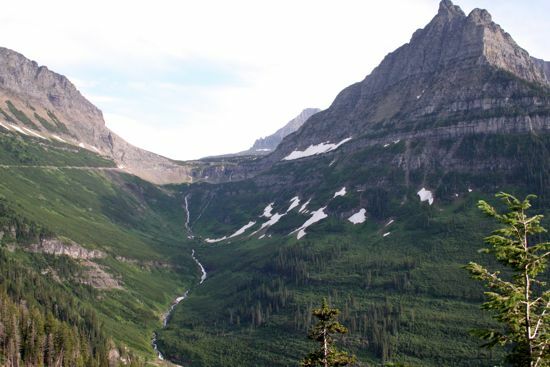 Then, across Idaho's panhandle and into Montana for three days at Glacier National Park. 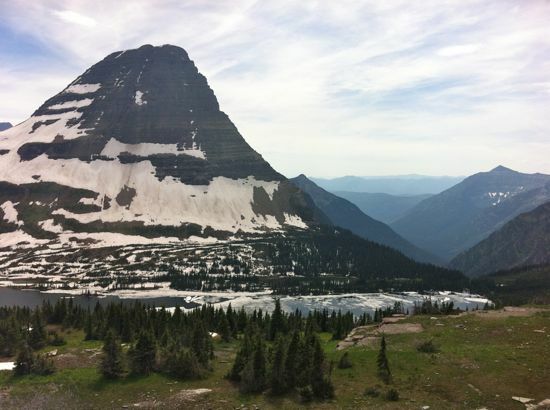 We started on the west side, camping at Fish Creek and hiking to Avalanche Lake. One the way to the lake, we startled this strange little animal peeking out of its home. Actually, it's sort of interesting that we didn't see more little animals (lots of birds, though) since there's so little in the way of undergrowth in Glacier's forests. Tree trunks for ages (all looking very alike, too, so don't wander off the trail) but all sorts of open space between them, a bit of a contrast for those of use coming from the rather jungley Pacific Northwest, where plants grow on top of other plants and the undergrowth can require a machete. 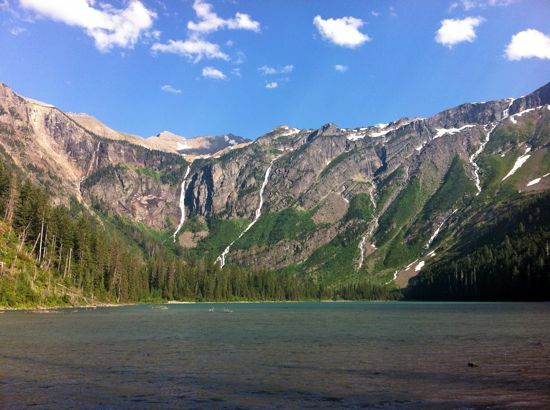 Avalanche Lake is fed by snowmelt and retreating glaciers. There are at least five waterfalls in this photo. The lake is the head of a river that's carving a path out of the mountains as it heads downhill. The river has some perfectly curved, perfectly smooth rock edges. The Going-to-the-Sun Road, the one road through the park, was closed due to a mudslide, so we had to drive around the outside of Glacier. We set up a new campsite and drove up to Logan's Pass. At Logan's Pass, we stopped for a "quick hike" near the Visitors' Center. The winter snow was still melting off, so everywhere was damp and swampy with tiny waterfalls. The trail was about 50% snow covered, which we didn't fully realize until we were pretty committed to the hike. Yes, Caitlyn is in sandals. The hike took us to the overlook at Hidden Lake. I don't know that the photo does it justice. The surface of the lake was still melting. Over on the right side of the lake you can sort of make out where the water exits the lake, becoming one of the hanging waterfalls we saw from the road later. If you need more visuals, Ian took a panorama. 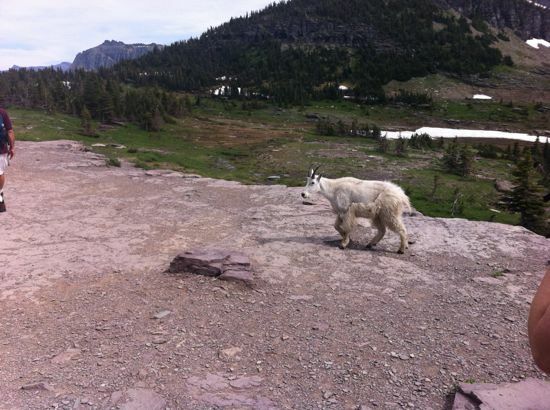 We also saw mountain goats. Caitlyn thought it was awesome that the goats used the trail and the boardwalk, just like the people. The goats totally didn't care that there were people nearby. Our "quick hike" had turned into a several hour adventure that included a very cheeky chipmunk and the realization that melted snow is somewhat warmer than still-frozen snow. 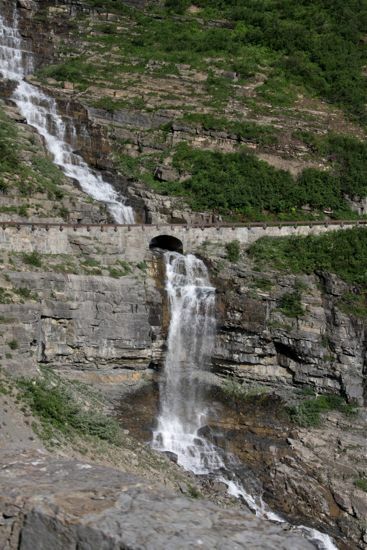 By the time we came back to the Visitors' Center at Logan's Pass, the mudslide had been cleared and we could go check out the really dramatic part of the Going-to-the-Sun Road. The road sort of just hangs off the side of the mountain. Look out one window and the view falls away into the valley. Look out the other and the mountain is right there. Along one stretch, there were waterfalls that were probably seasonal so they didn't have catchbasins and underpasses for the water; it just fell on the car. 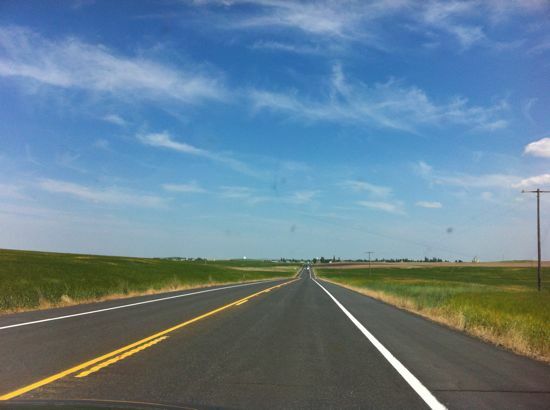 The road is also notable for the care that went into building it. It sort of disappears into the scenery. They'd never manage to build such a thing now - the lip of stone that is the "guardrail" is super short, mostly making the suggestion that there's an edge here and perhaps you should be careful. Any modern roadbuilding would need a concrete barrier topped with reflectors and the views would be totally ruined. We had our other close encounter with wildlife the next morning when a black bear (the neighbors estimated it was a year old or so, based on size - I simply thought he was big) wandered by our campsite. He made all kinds of noise, rustling through the plants and banging at trees before tearing a rotting log into pieces, so everyone knew he was there. Like the goats, he gave no sign of caring that there were people near either, but the people were all very careful to not crowd him and to talk enough so that he would know we were there. After all the signs about not feeding bears, it was a bit of a relief to discover that this bear had absolutely no interest in joining us for breakfast; he was perfectly happy digging for grubs and worms in that rotten log. After Glacier, we headed east and south through the Blackfeet Nation, stopping at the Museum of the Plains Indians. It features mostly the arts of the plains tribes: beadwork, textiles, and painting, both from the time before the tribes lost most of their land to the Americans and from now. Caitlyn and I chatted with two artists at work (whose names I didn't get and now can't find in the museum's archives) in the special exhibit areas. In Great Falls, Montana, we stopped at the Lewis and Clark Trail Interpretive Center for a nice overview of their Grand Adventure. On the way to West Yellowstone, we stopped for a while at Nevada City, a little ghost town partially made of local buildings and partially from historical buildings "rescued" from other locations and brought here. There was a living history event going on, with "interpreters" in costume (they were quite clear that they weren't "actors"). The men talked a lot about vigilantes and the women offered baked goods and opportunities to spin and quilt. 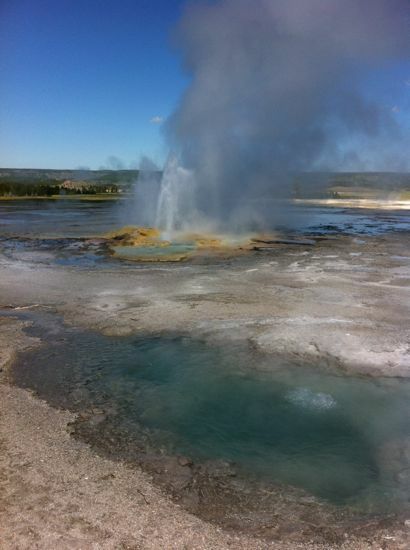 And then: three days in Yellowstone, geeking about geology. 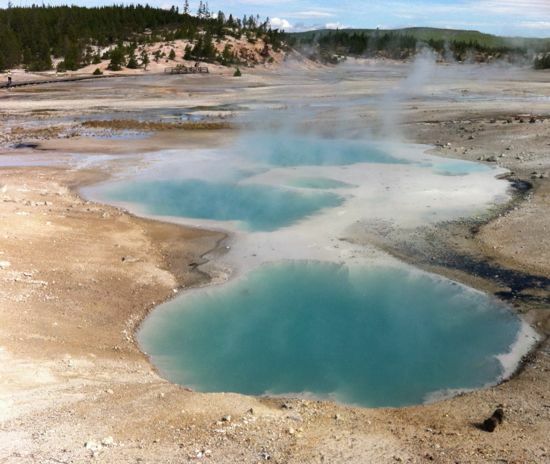 Hot spots, calderas, thermophilic lifeforms (mostly bacteria), hot springs, geysers, mud pots, boiling lakes. What's not to love? 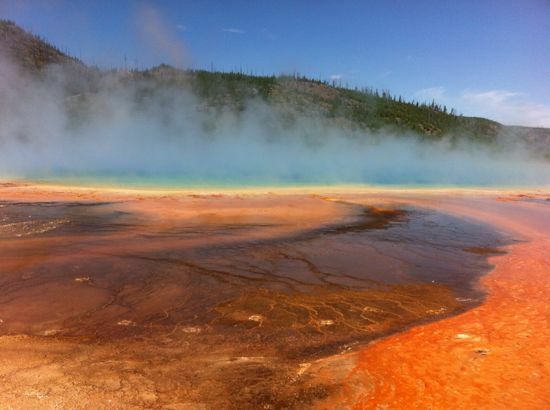 The Grand Prismatic Spring at Midway Geyser Basin. Everyone takes a picture of this one, it seems. Yes, it's really this color. No Photoshop here. 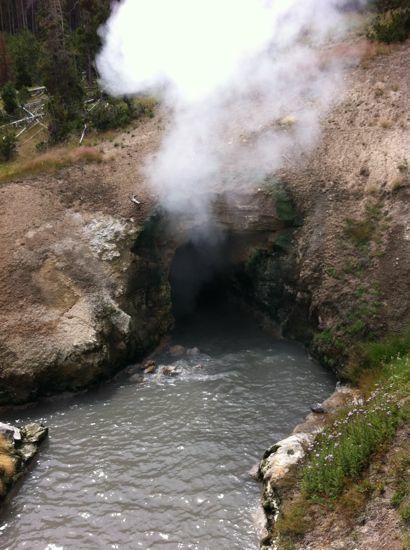 Dragon's Mouth near Mud Volcano. It doesn't erupt so much as it breaths and belches. 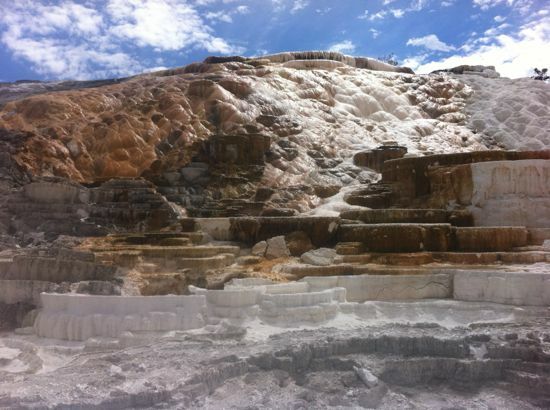 Lots of sulfur here - smells terrible! Norris Basin also smells terrible, and the acid in the environment makes it a rather otherworldly place. 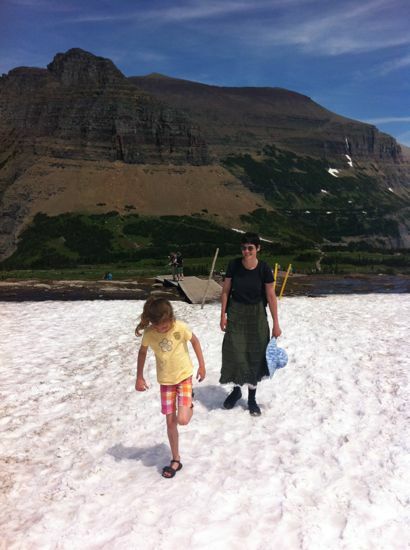 The ground here is hotter than anywhere else in Yellowstone. I think this is Porcelain Spring. Ian took another panorama here that really shows off the otherworldliness of Norris. 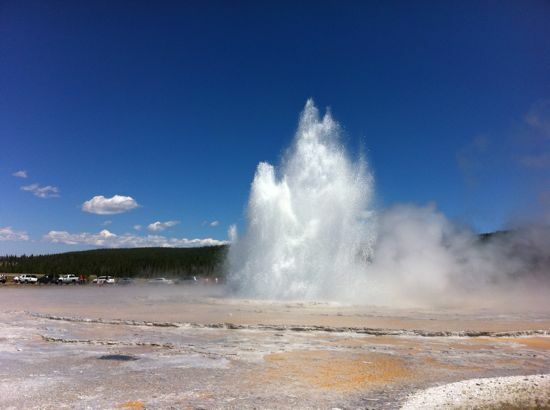 Beehive Geyser is extremely unpredictable, according to the ranger we spoke with. There's a small geyser near it (creatively named "Beehive Indicator") that starts to erupt about 5-10 minutes before Beehive goes. When the indicator starts to go, the rangers run around like crazy people trying to impress on everyone the importance of seeing Beehive erupt. We managed to see Beehive erupt twice. It sounds like a jet engine. 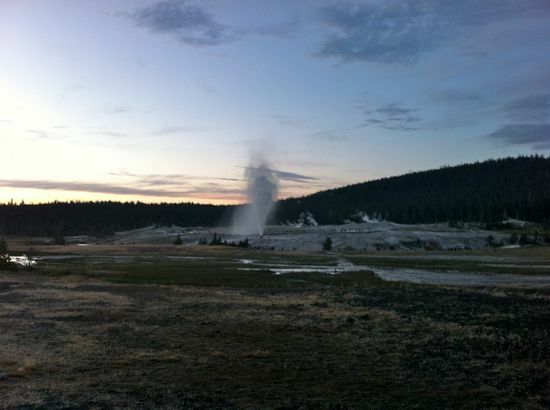 Beehive is in the same area as Old Faithful, which we saw erupt on three different occasions. It remains, well, faithful. This one is Clepsydra, whose name is derived from the Greek for "water clock" because it was so regular. Then, in 1959, it started erupting continuously and it hasn't stopped yet. Great Fountain is in the Lower Geyser Basin, and although it's one of the few geysers in the park that is predictable, the period between eruptions is about 12 hours. We happened to catch it. We drove up to Mammoth for the hot springs there. I expected them to be more dramatic. Apparently the plumbing inside shifts around all the time so that some of the hot springs are active while others are dormant, and then it all shifts. The rangers insist that they are keeping track of the amount of water leaving the hot springs for the river and that it's staying constant, regardless of how much it looks like half the hot springs have shut down. 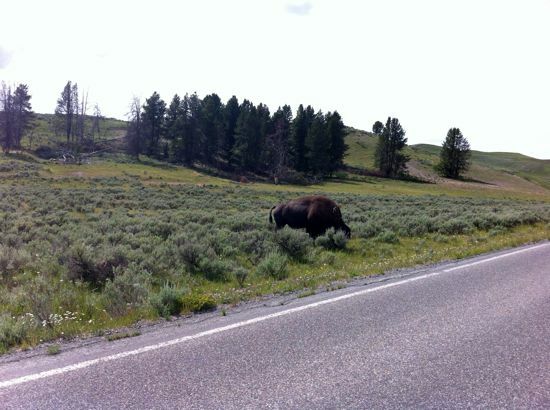 Oh, and we saw some bison. Some were very close to the road, so it was really easy to see how big they are. 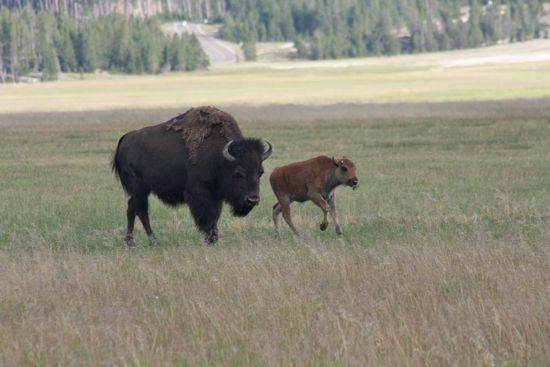 And some are new calves and are still big (although small compared to the adults). Kids are kids, regardless of species, and parents are parents. We watched some calves goofing around, charging and chasing each other, only to be clearly told by the adults present to "stop messing around and driving me crazy!" 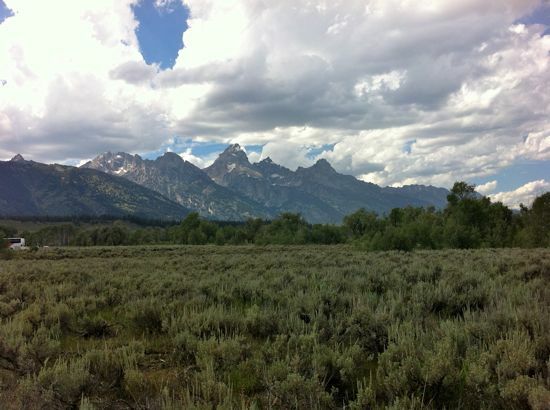 After Yellowstone, we drove south to the Grand Tetons, some of North America's youngest mountains (therefore all tall and sharp and dramatic - check out Ian's panorama), where we visited with family in Jackson. From here, we turned the car west and started hurrying back to the Pacific and the Natural Air Conditioning we coastal people love. 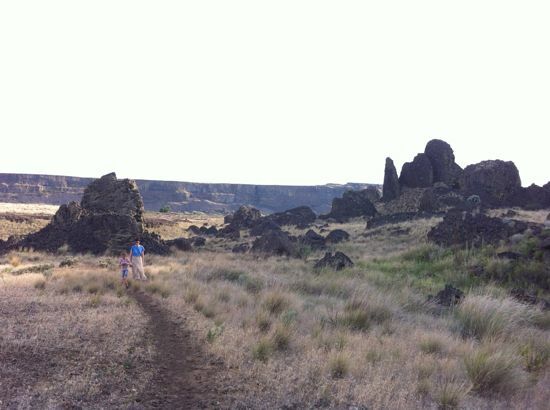 We made a brief stop at Craters of the Moon, a young volcanic field. The lava here was flowing only 2000 years ago, and it's so dry that very little weathering has happened. You can tramp around and check out lava flows, both the ropey a'a type and the rougher pahoehoe type (although the latter is simply hell on your shoes). 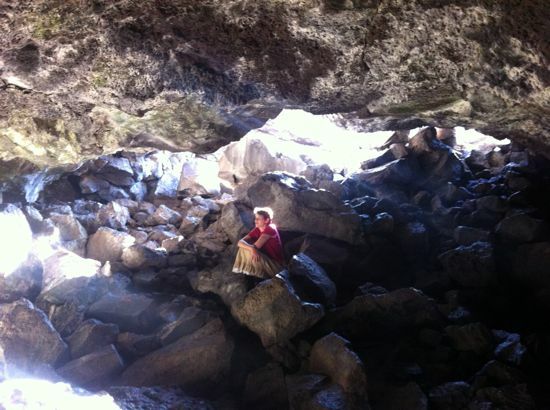 We climbed a cinder cone, checked out spatter cones, and climbed around inside lava tubes. Lava tubes are neat. They form when the top of a lava flow hardens and insulates the lava within, allowing it to keep flowing. The floor of a tube can be scraped up, it's walls can have little ledges marking how the lava level dropped as the eruption feeding it slowed, and it can have stalactites of once-molten rock hanging from the ceiling. And since they are caves, they can be very dark and very cold. Such a relief when the ground outside is black and close to 150 degrees in the summer sun. Here's another of Ian's panoramas, this one is of the inside of Dewdrop Cave. Well, that was our trip. Anyone still here? Are you bored to tears or snoring? If I offer dessert, will you forgive me for blathering on and on (and on and on)? Wow - magnum opus! Thanks for putting all this effort into sharing your trip. I was so immersed in your travelogue that when the phone rang I nearly fell off my chair. As soon as all the peach orchards are pulled out of the ground and chipped, we are going on a summer trip like this and to all the other places you should only visit in summer! Oh, I don't know... I think geysers in the snow would be way cool!